This is a powerful poem, about a man trapped in dreaming and contemplation of his future. The poet makes an exceptional use of imageries to explain this man’s state of mind but also his environment. The man is day-dreaming and plotting towards his grand ambitions by the cool waters of the Blue Nile gorge. The poet’s strong writing skills are demonstrated in the ways he uses the interplay and mix of words to draw attention to the complexity and deliberateness of the man’s thought process. 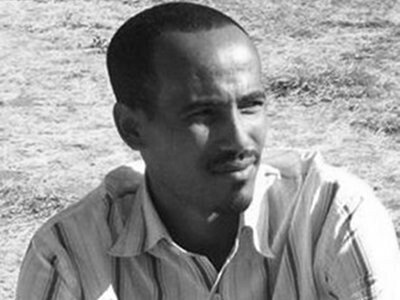 Demeke Kebede,aka, Felanemunemunim, a young Poet and Journalist, was born in 1985 at Gojjam – Motta Keraniyo, Ethiopia. He graduated at the Bahir Dar University in Journalism and Communication with distinction. He is currently completing his Masters Degree at Addis Ababa University Graduate School of Journalism and Communication. Demeke, as a journalist, has worked in various national and international media from Junior to Editor-In-Chief level and correspondent too. He has received numerous certificates for his performances and achievements in Journalism. He has written lots of poems and literary works. He loves writing novels especially poems and features. Demeke published his very first collection of poem, YERAS TILLA, which means Self Shadow, when he was a university student. His second poetry collection, Annd Kinf – Mono Wing, was published in 2011. And, now, he is currently compiling another collection for publication. He is a Deputy Manager of National Eye Bank of Ethiopia. He is also an active social media writer.